Today is the Sunday in which the Church celebrates the angel appearing to Mary and telling her she was to bear God’s Son. It is called the Feast of the Annunciation. 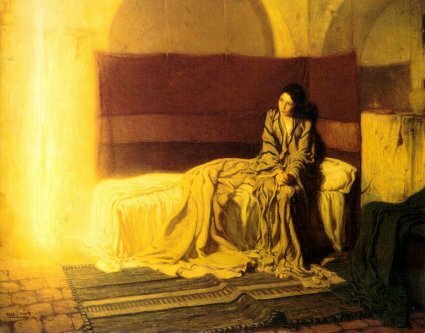 One of my favorite paintings is of this event, done by Henry Ossawa Tanner (the first African-American painter to rise to international acclaim), it shows Mary as I imagined she would be: young, slightly confused, and a bit overwhelmed. When you think about it, this was the moment that God became man, and as Hebrews reminds us, became in all things like us, even spending nine months in the womb, being born, then a baby, a child, a young boy, and finally a full grown man. One of my favorite Christmas hymns is “O Come All Ye Faithful.” It has a line in verse two that is very appropriate to this discussion. It was at this moment, not at his birth, that the God of all creation did not abhor Mary’s womb. I sometimes think we do not appreciate the enormity of that line we blithely sing and then quickly forget. There were two moments of significant choice in the journey of the Son as he became and lived as the man Jesus of Nazareth: this is the first. He chose his conception and accepted its consequences, as the song says, “Lo! he abhors not the Virgin’s womb.” The second I have discussed three times, earlier in these meditations (Gethsemane). This morning, my friend and pastor of our church, Martin Eppard, repeated what he called an old preacher’s play on words about this moment. The Son of God became the Son of Man, so that the sons of men could become the sons of God. I love little aphorisms like that. They put deep truths in a form anyone can understand. So, as I retire for the evening, to prepare for another week of work, et alia, I leave with you this thought. The next time you feel vulnerable, think of the Son of God and the vulnerability he accepted at this moment for those whom he loved. May that give you the grace you need to face your time of need.